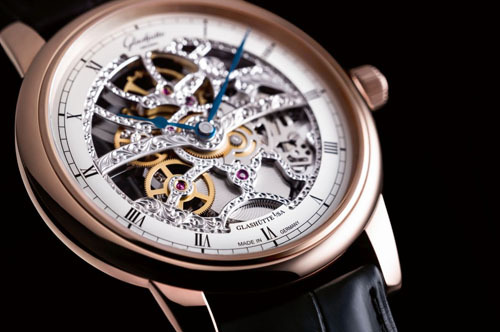 The latest, skeletonized luxury watch from Glashütte is the stunning Senator Manual Winding Skeletonized Edition. This stunning watch includes the watchmaker’s own Calibre 49-18, includes intricate mechanics, and gorgeous artfully executed engravings. The watch’s blued hour and minute hands clearly show the time of day. The galvanized silver, skeletonized dial features a black railroad minute ring as well as thin Roman numerals. Contained in a beautifully polished red gold case, the Senator Manual Winding Skeletonized Edition watch from Glashütte is 42 mm in diameter. The new watch model comes with a 40 hour power reserve. The Glashütte Senator Manual Winding Skeletonized Edition luxury watch is definitely a masterpiece of fine watchmaking and a thing of beauty. A fine watch connoisseur will quickly notice the perfect detailing and craftsmanship. The watch’s filigreed work of art is perfectly protected on the dial side by a beautiful sapphire crystal which is anti-reflective on both sides, In addition, you’ll find an anti-reflective sapphire crystal that’s been fitted to the back of the case. This stunning design allows the timepiece wearer to enjoy the view of the finished components of the watch’s movement, in addition to its artful engravings. What sets this fine luxury watch apart is how the precisely executed skeletonization reveals the exquisite beauty of the manufactored Calibre 49-18. If you are interested in purchasing this Senator Manual Winding Skeletonized Edition watch from Glashütte or any luxury watch, please contact us today. Stay on top of luxury watch news by following this luxury blog.